These layered dessert bars are so yummy! 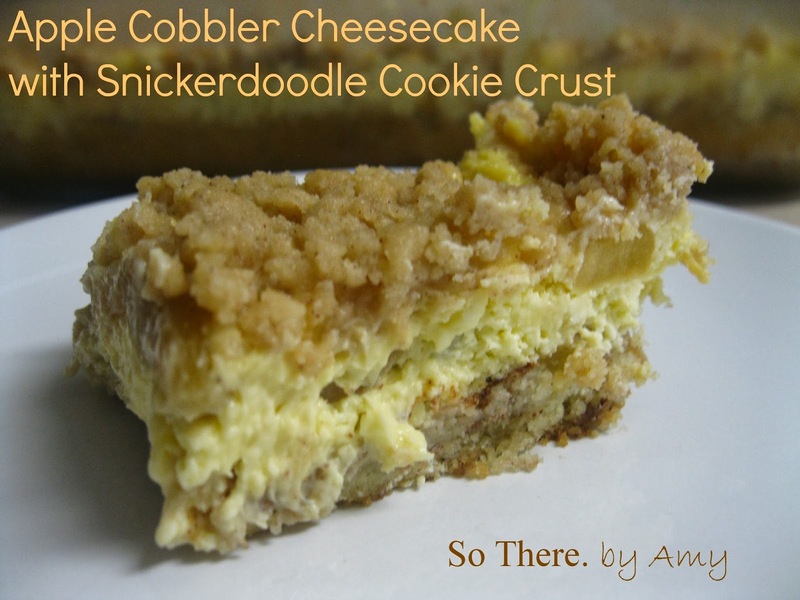 The crust is a snickerdoodle cookie, topped with cheesecake, then homemade apple pie filling pressed into the cheesecake, and lastly, a crumble topping. First, start your apples, if you are using fresh. In a pinch, you can use canned apple pie filling instead. But, if you can cut up an apple, you can make your own from scratch! 2-3 apples, peeled, cored, and sliced or cubed. Place diced apples in a large pan. Sprinkle with sugar, cinnamon, and nutmeg. Mix well and cook over low heat, stirring frequently, until apples are tender but not mushy. Make a snickerdoodle cookie dough, and press into a 9 x 13" pan. I used This Recipe. I halved the recipe, and once you press out a good 1/2" thick crust, if you have leftover dough, just make a couple cookies later. You need to make sure all the layers end up fitting in the pan. Next, onto the cheesecake batter. Again, just use your favorite classic recipe, or mine below. If you use your own, you might need to half the quantity, or adjust, as needed. No need to adjust if you use mine. Beat the cream cheese until smooth in a large bowl, scraping down bowl, as needed. Beat in the sugar until incorporated, about 1 minute. Add in the egg, and blend until completely combined. Beat in the sour cream, lemon juice and vanilla until combined. Pour over the snickerdoodle cookie dough crust. Spread cooked apple mixture over the cheesecake layer evenly. Lastly, (I didn't say this was simple, I said it was delicious!!) make a crisp streusel topping. Combine all ingredients with a fork or your hands, until the butter is well combined into the crumbs, and it forms even clumps. Sprinkle over the top of the apples. Now, Bake this awesomeness at 350 degrees, for 40 minutes, or until cheesecake is set. Let cool, then refrigerate until well chilled. Cut into bars.